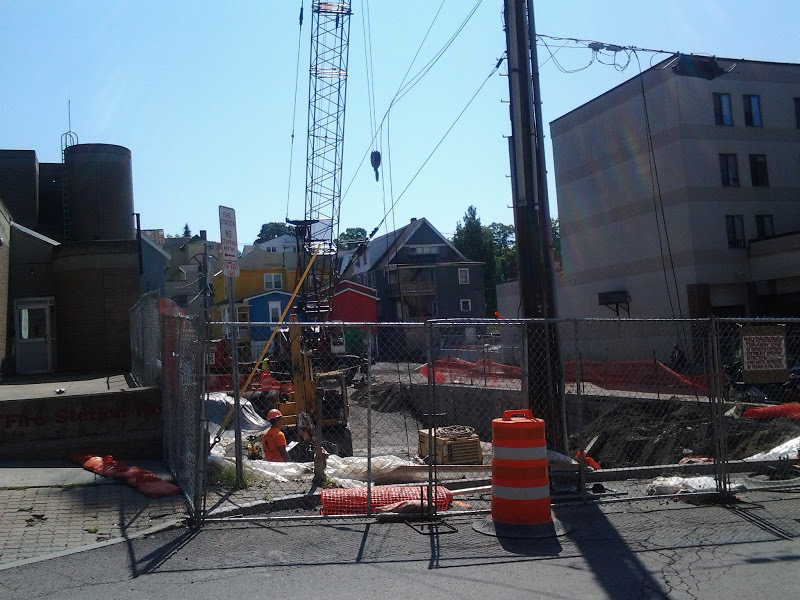 The last in the Collegetown trio of midrise apartment buildings underway, and the biggest, is Josh Lower’s Collegetown Crossing project at 307 College Avenue. Like 205 Dryden and 327 Eddy, it’s time to give this building its first progress report. 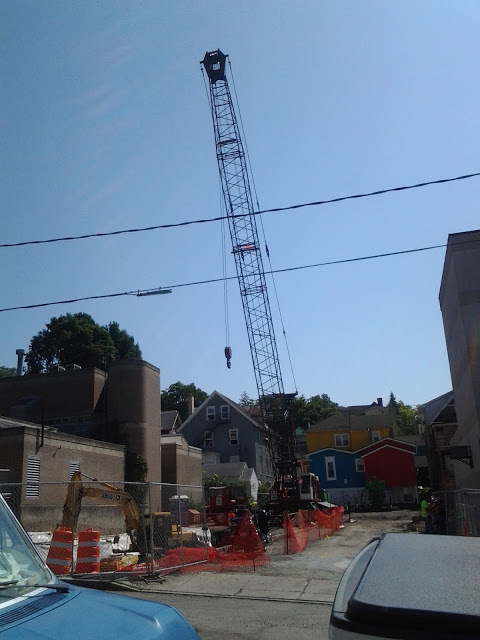 A telescoping boom crane looms overhead as work continues on the foundation of the new building. An excavator is at work digging down to the appropriate level for foundation piling. The two-story concrete masonry unit (CMU) box that previously stood on-site has been demolished. Apart from the murals, there won’t be much missed about the ca. 1980 structure. 307 College had been home to a branch of Kinney Drugs up until about 2006, and afterwards, its commercial space was partially occupied by Ithaca Carshare. The second floor contained several apartments. The Lower family, who run the Urban Ithaca rental company in Collegetown, bought the property for $1.725 million in 2007. Plans for the property were first announced back in 2009, but with parking requirements still in place, the project would have needed a zoning variance of 57 parking spaces, which the city was uncomfortable with. The project stalled and was unable to move forward with further review until the city passed revised zoning codes for Collegetown in March 2014. There were actually two notable impacts as a result of the zoning code update – one, that it could be built in the first place; and two, that the rear portion, which had been six stories like the rest of the building, had to be chopped down to 4 stories since it fell into a different zone (the building straddles two lots; the rear one is part of the new CR-4 zoning, which only allows four floors, and the front portion is MU-2). This reduced the number of bedrooms from 103 to 98, and later, 96. The final plans were approved last September, and the groundbreaking ceremony was just last month. Collegetown Crossing will have 46 apartments with 96 bedrooms when it opens in August 2016. Along with those units, the project will host a 3,200 SF branch of local grocery co-op Greenstar on its ground floor. Two smaller commercial spaces are also included. A heated bus shelter and a narrow “pocket park” traversing College Avenue to Linden Avenue will also be available for public use. 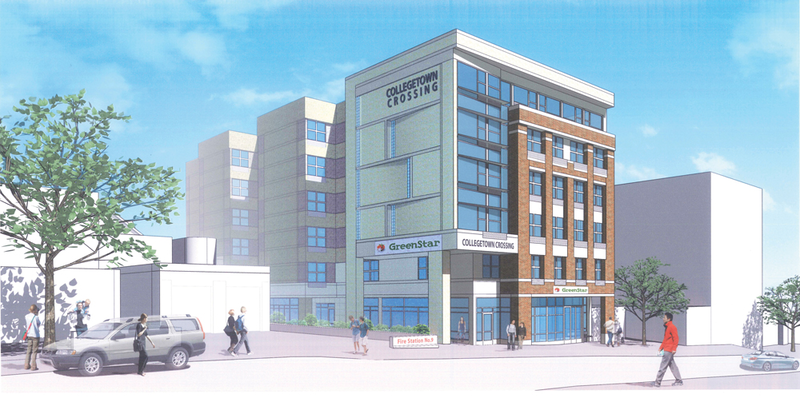 With a true grocery store coming to Collegetown, residents have generally been in favor of the project. There’s no construction loan on file, but the FEAF estimated $5 million to build. The grapevine says it actually might be more in the line of $7-8 million. Also a plus, there were no tax breaks requested or given. Local architect Jagat Sharma can put another feather in his cap, as this project is another of his designs. 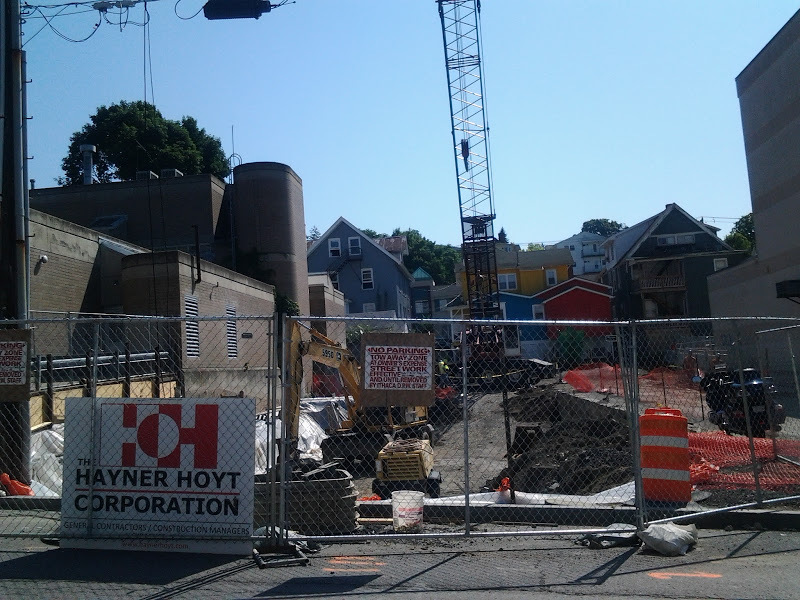 Syracuse-based Hayner Hoyt Corporation will be in charge of construction.